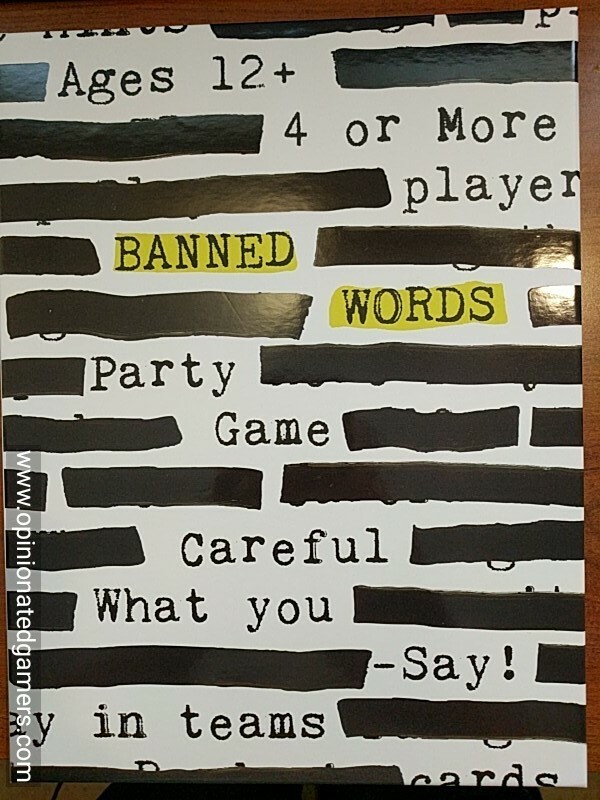 Banned Words is a new party game from Wonder Forge, meant for the American mass market. In this game, players split up into two teams. A divider board is placed in the center of the table so that each side cannot see the area on the table just behind the screen. There is a deck of 168 target word cards – each of these has five words printed on them. One team draws a target word card and places it on the table so that all of their teammates can see the card, but the opponents cannot. The team also gets a set of markers and 16 erasable tiles. A sandtimer is flipped, and the active team now writes down banned words, one banned word to a tile. These words are words that they think their opponents will use while trying to describe the five target words. The phase goes on until all 16 tiles have a word on them OR the timer runs out. Now, the other team does the same; draw a Target word card, flip the timer and then fill out their banned words on tiles. You cannot write down a form of a target word on a tile nor the target word itself. You may also not write common pronouns, conjunctions nor prepositions on the tiles. You may not have duplicates amongst your banned word tiles. Now it’s time to guess the words. Each team nominates a clue-giver (we generally rotate through the team members), and the two clue givers exchange target word cards. The clue-givers should look at the card secretly so that their teammates cannot read the words on it. The phase is played one team at a time. The timer is again flipped over, and now the clue giver must try to get their teammates to shout out the target words. The clue giver is not allowed to use translations of the target in another language, cannot use parts of the target word in other clues, cannot use charades or other gestures to clue nor can the cluegiver use “starts with” or “rhymes with” clues. When the guessing team correctly says a target word, the clue giver acknowledges the correct answer and then moves onto the next target word. The Clue giver can give clues in any order and can skip around as he chooses. As the clues are being given, the other team should have their pens ready. Each time that a banned word is said by any player on the other team, a mark is made on the tile with that word on it. The round continues until either the guessing team has correctly said all five target words OR the timer runs out. At this point, it’s time to tally up the scores for the round. The guessing team gets one point for each target word they were able to say out loud. The other team gets one point for each mark on their banned word tiles – that is, one point for EACH time anyone on the opposite team said a banned word. Then the roles are reversed and the other team guesses target words. This is repeated for three full rounds, and the team with the most points at the end of the three rounds is the winner! Well, when I first opened up the box and looked at the rules, I thought that this was just going to be a Taboo clone. And, to be fair, it uses a lot of the same ideas. 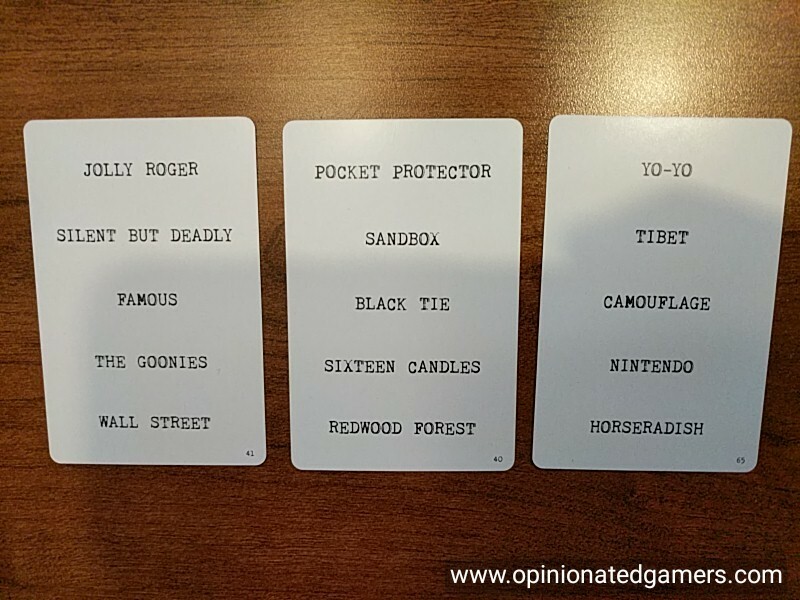 The difference here is that the players themselves get to decide which are the Banned Words rather than having them simply be printed on the card… This makes the game a little more interesting because you can decide what you think the other team will use when giving clues. Each team gets 16 banned word tiles and five words to use them on. There is no restriction or recommendation on how to divide up the cards. Most times, the tiles end up 3-3-3-3-4 just to do it as evenly as possible; though if you think there is a particularly hard word to guess on one which has a lot of easily guessed words, you might try to load up on these. Don’t forget that each time someone says a banned word, you get a point – so this is definitely a viable strategy. Of course, while you’re writing down the banned words as a team, you have to do it silently. If you are discussing things out loud, the other team will hear – this will not only give them clues as to what the target words are, it may also let them know what the banned words are! This makes the job much more challenging. This game has been a surprise hit… I thought it would be panned by my group as just a clone of Taboo – but there is enough different here to keep it interesting. As our clue giving has evolved, so has our allocation of banned words. It has become an interesting double-think game. Many times now, an obvious banned word isn’t written down because the hope is that it will be avoided anyways by the cluegiver since it is so obvious… This then gives room for more esoteric words to be written down. Of course, the clue giver knows that, and there are times that it might be worth using a simple obvious clue word that will hopefully get the right answer while risking hopefully only a single point to the opponents. But even looking at it in the simplest way – it’s hard to really know what the other person is going to say. What would you choose if the target word was “Han Solo”? Millenium? Leia? Star? Wars? Carbonite? Kessel? Kylo? There are so many different ways to go about it – so it’s hard to narrow it down. Or what sort of clue would you give? You could be a bit obtuse and say “I’ve got a bad feeling about this” and hope that someone gets your reference. The tiles are sturdy and thus far, they have cleanly erased with each play. Also, the pens have held up well and have not yet dried out – this is one of the biggest issues that I’ve found with dry-erase markers in boardgames; oftentimes they are DOA. The target word selection is varied nicely, and there shouldn’t be any words on the cards that an American teenager (or older person) shouldn’t know. I also like the clever way that the designers have made the screen. The screen is nice and tall, five panels wide – and the rules are printed on both sides of the screen. In this way, no one can ever say that they didn’t know what the rules were, and nothing has to be pulled out of the box if someone has a question about the rules in the middle of the game. This is a fun addition to the party game genre, and one that I have enjoyed thus far. In my group here that likes word games, crossword puzzles and puzzle hunts, this really allows for creative play – both on giving clues as well as devising banned words – and should hit the table a lot with that crowd. The rules are dead easy, and the game should also be perfect for casual party game play as well with folks who are not into cryptic crosswords – the clues and banned words will simply be on a different level. The great thing about this game is that it can support both populations with the same components! You should be able to take a look at the game or play a round or two at the booth at GenCon 2017.